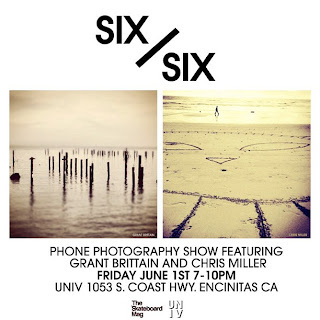 Last week, Chris Miller and Grant Brittain did a phone photography show together at UNIV in Encinitas called "6/6", named for the size of the images, 6 inches by 6 inches. Grant Brittain picked up a camera 1979, when he was 25 years old and started shooting his friends skateboarding at the Del Mar Skate Ranch while working there from 1978 to 1984. After going through massive amounts of film, he took every photo class Palomar Junior College had to offer. And with that, he felt he finally learned how to manipulate his 35mm camera. 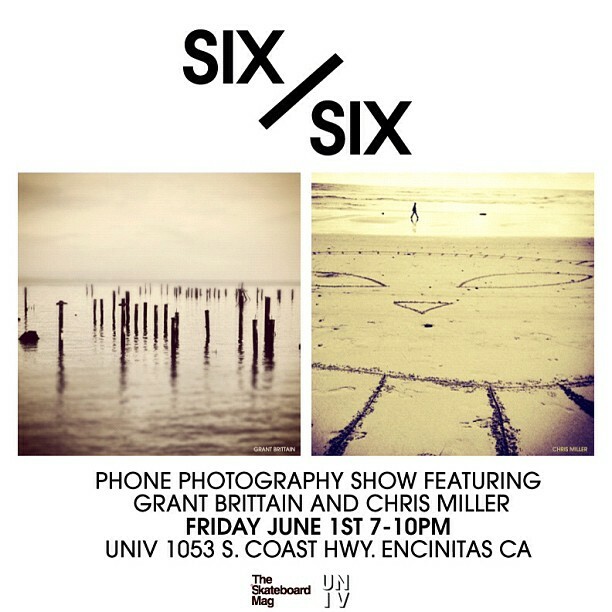 While at college, an influential instructor introduced Brittain to the vast world of photography, and set him on his creative path. In 1983, Grant was asked to contribute skate photos to the premiere issue of TransWorld SKATEboarding magazine and became its founding Photo Editor and Senior Photographer. Over the last 32 years Grant has captured the best skateboarders of the last three decades many of his photos have become classics. He has also taught some of the best skate photographers, past and present, and helped them develop their own work. Grant Brittain’s body of work reflects his deep involvement in an emerging youth culture, as well as his escape from it. In 2003, Grant Brittain, Dave Swift, Atiba Jefferson and Jon Humphries and a group of the skateboarding elite talent left TWS and started The Skateboard Mag, where they all thrive creatively to this day.